Yesterday afternoon's concert at Convention hall by Battery B band will not be the last, according to an announcement from the stage. There was no question of the success of the event, every number being vigorously applauded, "Lohengrin" proving fully as popular as the one ragtime selection of the afternoon. The size of the audience was a surprise to the management, nearly 1,500 people being present. It was distictly a family gathering of fathers, mothers and the children. Mr. and Mrs. Newlywed and the baby were on hand and Papa Newlywed did a pedestrian "stunt" up in the balcony when the baby showed a disposition to rial the best efforts of the musicians. Director Berry ha arranged an excellent programme, comprising seven instrumental and two vocal numbers, which was more than doubled by the insistent encores of the audience. 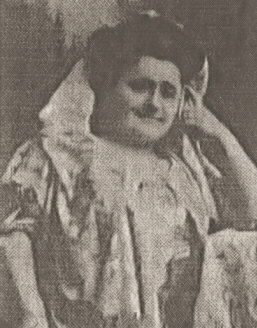 Miss Mildred Langworthy was the soprano soloist and Ross Dale the tenor. Both pleased and were compelled to respond to encores. The feature numbers by the band were a fantasie from Wagner's "Lohengrin," the overture from Offenbach's "Orpheus," and exquisite number beautifully rendered; a euphonium solo, "Evening Star" from "Tannhauser"' Nevin's dainty "Narcissus." The closing number was called the "Congress of Nations" and comprised the national airs of various countries. To give a spectacular touch, members of Battery B entered, one at a time, with the flag of the country as the band played the national air, closing with "The Star Spangled Banner" and Old Glory brought a storm of applause. Yesterday's concert demonstrated that Kansas City has a large class of music lovers who do not require the stimulus of a great name to induce them to turn out. The classic selections on yesterday's programme were equally enjoyed with the lighter numbers. Director Berry had the courage to omit "ragtime" save in one single instance, and no one, apparently, felt very badly over it. The detective department is looking for four "good fellows" who appropriated the drummer's outfit of William G. Viquesney, a member of H. O. Wheeler's band, during the automobile show in Convention hall. The date on which the drums, tambourines, whistle, etc., were supposed to have been taken was January 19. It was on that night that four well dressed white men, half intoxicated, took the instruments to a pawn broker on Grand avenue and realized about $25 on them. The more valuable of the collections were recovered by Mr. Viquesney yesterday. The first promotion of any moment to be made by the present police board took place nar the close of the meeting yesterday when Sergeants Robert E. L. James and Frank H. Anderson, who have given the better parts of their lives to the service, were made lieutenants. Anderson is said to be a Republican and James is a Democrat. Neither man got much encouragement from former boards though their records are both clean. Anderson, now assigned to desk work at No. 3 station on the Southwest boulevard, went on the force November 9, 1889. On account of his intelligence and adaptability for the work he was assigned for m any eyars to duty in the city clerk's office where he served papers in condemnation suits and did clerical work. On January 9, 1907, while H. M. Beardsley was mayor, Anderson was made a sergeant by a Democratic board. His promtion is said to have been due to former Mayor Beardsley's efforts. Lieutenant James went on the department as a probationary officer July 22, 1889, a few months before Lieutenant Anderson. As a patrolman James has walked every beat in Kansas City. 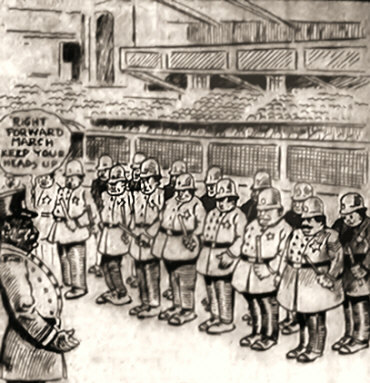 On July 22, 1902, he was promoted to sergeant. James early showed particular efficiency in handling large crowds. While outside sergeant at No. 2 station in the West Bottoms during the destructive flood of June, 1903, James distinguished himself. Last July, when still a sergeant, James was assigned by the police board to Convention hall as instructor in the matter of police duty. This pertained to the old men, already on the force as well as new recruits. In all 241 policemen were instructed in groups of from twenty-five to seventy and their instruction lasted from seventy-two to ninety hours per group. Lieutenant James also had charge of the initial opening of Electric park a few years ago. For two weeks he has had charge of the desk at No. 7 station in Sheffield. Lieutenant James was born at Tipton, Cooper county, Mo., October 17, 1867. His father, Dr. P. T. James, was assistant surgeon general to General Sterling Price of the Confederate army. Some time after the war the family moved to Holden, Mo.. Lieutenant James is married and has four children. He is a brother of Dr. Samuel C. James, a member of the general hospital staff of visiting surgeons and physicians. SHOW OF THE 1910 SEASON. "There was a sound of honking by night and bright the lights shone on fair women and brave men" -- slightly to modify a well-spouted quotation. All the "fuss" was over the opening in Convention hall last night of the automobile show given their this week under the auspices of the Motor Car Trade association and never was the debut of such an enterprise more signally successful. Miracles of order had been wrought out of the chaos which prevailed in the big hall yesterday morning. By the time the doors were thrown open to the general public at 6 o'clock yesterday evening the hall had been transformed from a wilderness of glittering confusion into a most charming garden of exhibits, with trim paths winding in and but a green hedge dividing the big arena floor into two sections. Overhead the "sky" was a beautiful canopy of blue and white bunting while the horizon was one of the most novel decorative effects ever seen at a Kansas City automobile show. It consisted of a huge panel running entirely around the hall and composed of heroic reproductions of Western paintings by the late Frederic Remington, a most tasteful and effective emphasis of the fact that this is a western event and that Kansas City is the "center, hub and core" of all the expanse of territory made famous by the gifted brush of the artist who "should have died hereafter." "But the people! A, the people!" as another lamented American remarked. They were part of the show, and not the least interesting part. They came by the thousand and they swarmed, literally swarmed, all over the huge building, which seemed "cablined and confined" under the stress of their seemingly endless numbers. Never were there such crowds at such a function in this city. If the spirits of the horses that were wont to attract other thousands of enthusiasts in days gone by were privileged to look down on that spectacle, they would not have been in the mood for any "horse laughs." Their occupation's gone. At least, their friends were not in evidence last night, for those interested throngs had gathered to worship at the shrine of the limousine and the coupe, the runabout and the chassis, the town car and the tourabout, even the elephantine commercial trucks. No, it was not a horse crowd that filled Convention hall last night and if there were any horses in the vicinity they were the patient draught animals outside in the alley that had hauled accessories, exhibits and other loads of material to make up the "side lines" at the big show. That was "rubbing it in" just a little, and the more sensitive of the horses might have been pardoned for imagining that there was a note of derision in the occasional "honk! honk" t hat resounded throughout the hall. It was really an impressive scene that greets the spectator as he enters the arena at the southern end of Convention hall. Far at the other end of the hall he sees, in a delightful perceptive, a fairy grotto rising in tiers seemingly to the roof. That beautiful feature is the Japanese tea garden, one of the most effective pictures in the whole show so far as decorativeness is concerned. Above the spectator's head he hears the inspiring music of the Berry Military band. By the time the spectator has taken in the general effect, he is ready for details. As he threads his way amid this orderly maze of about 175 cars of forty different makes, he realizes to some degree at least the extent of the automobile industry, the reason for the firm grip which the "buzz wagons" has on the pocketbooks of the people of the United States -- and why Kansas City sold something like $10,000,000 worth of automobiles last year. The green hedge divides the central space of the arena into two sections, taken up with the exhibits of six local agencies. A wide walk runs entirely around this central space and between this walk and the arena boxes are other spaces filled with immense varied and complete exhibits, beginning with the Studebaker lines at the right, next to the arena entrance and ending with the big Ford display on the left, after the circuit of the hall has been completed, during which the exhaustive displays of Maxwells, Marmons, Reos, Detroit electrics, Hupmobiles, Regals, Mitchells, Stoddard-Daytons and other lines carried by the McGee-Huckell Company have been included. While the interior decorations this year are more cleverly done than ever before, the other parts of the hall have not been overlooked. As there are automobiles, touring cars, runabouts, electrics, and trucks on every inch of available floor space, pretty decorations have to go with them. The entire arcade is crowded with displays and some of the best exhibits of the entire show have been placed here, for the arena floor is by no means all there is to Convention hall for exhibition purposes. The big Columbus-Firestone, Standard Six and Hupmobile exhibits are in this section of the building. Every nook and cranny of the balcony is taken up with accessories exhibits and it will require more than one visit to exhaust the treasures of this big carnival of automobiles. A new meaning was given yesterday to the "horse laugh." From 1,000 to 1,500 horses in Kansas City not accustomed to a square meal stood in their stalls, free from work and protected from the weather, and munched full portions of the best oats the market affords. And these horses laughed. It was Christmas day and they were enjoying a Christmas celebration planned especially for them. The "feed' for poor work horses was given by the Kansas City Humane society as the result of a plan evolved by Mrs. E. D. Hornbrook and Mrs. E. H. Robinson, members of the board of the society. For the purpose of carrying joy to the hearts of the poor animals which struggle under burdens on the streets of Kansas City every day and which are indifferently fed and kept, largely because of the poverty of their owners, the Humane society purchased a half dozen tons of the best white oats and did the grain up in five and ten pound sacks, giving out these packages to owners of horses whose cases had been investigated by the society and to whom tickets previously had been given. About 1,000 of these tickets were given out and sacks of the grain were also given to others who had not received tickets. Provision was also made for still other cases and an automobile furnished by the Kansas City Rapid Motor Transfer company will take "feeds" to the cases which were reported too late to be cared for as were the others. It was at Convention hall that the Christmas dinners for the poor horses were given out and the committee in charge of the distribution was composed of Mrs. F. D. Hornbrook, J. W. Perkins and E. R. Weeks, president of the Humane Society. The sacks containing the oats were placed on long tables and when horse owners applied for the "feeds" they were required to present their tickets, give their names and the names of their horses. They were then given the sacks of feed, a tag which they promised to read and a copy of "Black Beauty." Where owners had sick horses they were also given blankets for the disabled animals. "What is good for your horse is good for his master. Your horse needs good care as well as good food. Never work your horse when he will not eat. Water your horse often. Water should always be given fifteen minutes before feeding grain. Daily grooming will improve the health as well as the looks of your horse. Give your horses rock salt, and head shelter from the heat. Economize by feeding good oats and good hay. Good drivers are quiet, patient and kind, and have little use for a whip..." and so on. "This horse dinner means a great deal more than most people think," said Mrs. Hornbrook. "It is intended to show the horse owners that their animals must be cared for and to set an example for them to follow. Some of the papers have made a humorous affair out of it, when it is anything but humorous and has a most humane object. "It is not intended simply to fill the empty stomach of some poor animal for the time being," said Mr. Weeks, "but is to create a kindly sentiment for dumb animals. We show the horse owners what a sample meal is and that is something some of them know very little about. The ten pounds of oats we give them is a double portion of a standard feed. The owners of all the big fine animals we see hitched to drays on the streets feed their horses five pounds of the best oats at a meal. Along with the oats we give out, we also give the horse owners a copy of 'Black Beauty' and the tag containing advice about the care of horses an d we hope your Christmas dinner for the horses will do good." To many horse owners, who called for feed at Convention hall between 9 a. m. and 6 p. m., Mr. Weeks, Mrs. Hornbrook and other workers agents of the Humane Society gave good advice. Some of the callers were persons with whom agents of the society had come in contact in their work and there were scores of promises, such as "well, we'll take better care of our horses from now on." Posted about the corridor in Convention hall yesterday, were copies of new cards issued by the Humane society. They read, "Be kind to your horse. Do not forget his water, feed and shelter." Christmas day was the most notable day for the poor work horse in the history of Kansas City. No wonder a new meaning was given to the slang expression, a "horse laugh." DR. B. F. ROLLER FROM SEATTLE AND ZBYSZKO, THE "POLISH GIANT." BY DR. B. F. ROLLER: "Zbyszko is a powerful wrestler and can beat most of them in a finish match, but I do not believe he can beat Gotch or myself. He has a powerful grip and his legs are like posts. It is almost impossible to get a toe hold on him. Gotch will do it and will win. Zbyszko looks like about the best wrestler among the gang of foreigners who came to this country." BY ZBYSZKO: "I can beat Roller in a finish match. He gouged the eyes and was unnecessarily rough, but I will beat him in a finish match." Zbyszko, the Polish Giant wrestler, had about as much a chance to throw Dr. B. F. Roller twice in an hour in their match in Convention hall last night as Stanley Ketchel had to knock out Jack Johnson in the first round of their battle in Frisco. It was an hour handicap affair and had the referee been empowered to give a decision on points at theclose of the bout it would undoubtedly have been in favor of the Seattle physician. Neither won a fall and as Zbyszko failed to throw Roller twice in an hour the doctor won. IT WAS A HEAD TO HEAD MATCH MOST OF THE TIME. From the very tap of the ringer Roller really had the better of the battle Zbyszko's strength was so great that he could push Roller about on the mat, but he had better holds on the Polish Giant than were put on the physician. Roller was much cleverer in dodging and breaking away from holds and his agressive work was far better than that of the Pole. But once did Zbyszko have a good hold on the ph ysician and Roller broke it with ease. Twice Roller had holds on Zbyszko which looked good for falls and one of them, a reverse half Nelson, all but brought home the money. Zbyszko had a hard fight to break the hold. While working on the mat Zbyszko was on the aggressive four times and Roller was on the agressive the same number. It was even as far as that was concerned, although Roller's offensive work appeared to be better than the Pole's. Roller tried for the toe hold all of hte time, except in one instance and that time he got a reverse half Nelson which looked good for a fall but the power of the giant from Poland broke it. Zbyszko tried for the toe hold and for arm and head holds, but only once had Roller in a dangerous position with a half Nelson, which was quickly broken. Several times during the bout Roller broke away from the Pole and regained his feet when Zbyszko held him around the waist. It was apparently easy for either man to get up out of the grasp of his opponent. For this reason much of the wrestling was while both were standing. DR. ROLLER TOOK THE DOUGH OUT OF THE BISCUIT, ALL RIGHT. While Zbyszko was considerably heavier than Roller his work did not show it except when the men were tussling about the ring, both on their feet. After thirteen minutes of work Zbyzsko got Roller to the mat for just a second when Roller broke away and again both were standing. Twenty minutes had been consumed when Roller put the Pole to the mat and got up again. Three minutes more passed and Zbyzsko downed Roller but the physician got up without much exertion. When twenty-six minutes of the hour had passed Roller picked the Pole up by the left leg and dropped him to the canvas. He tried the toe hold time and again but the short, stocky legs of the Pole were too strong. After thirty-seven minutes on the mat Zbyszko got up and got Roller around the waist but the clever physician broke away again. Forty minutes of wrestling found Zbyszko on top again and he took a half Nelson hold which looked good. The Seattle man gave a strain and not only broke the hold but regained his feet. The Pole got rough but he found a good oponent at that game in the physician, who, according to Zbyszko, amused himself by trying to misplace the Pole's eyes and nose. After forty-five minutes of wrestling it was apparent that Roller would win the match as he had the advantage. He picked the Polish athlete up by the leg and dropped him to the mat. Zbyszko turned him over and they were soon standing again. When fifty-one minutes had passed Roller went after Zbyszko like a tiger. He threw him to the mat and got a reverse Nelson, which took all of Zbyszko's strength to break. Zbyszko got on top again after a hard tussle and Roller got up. The bout finished with the wrestlers sparring in a rough manner. In the semi-windup Ed Somers defeated George Weber in straight falls. Both were one legged wrestlers. Dave Porteous refereed. The poor horses of the city will be fed to satiety at least once this year. By arrangement with the directors of Convention hall yesterday, the Humane Society, in conjunction with Mrs. Emma W. Robinson, 3208 East Tenth street, and Mrs. E. D. Hornbrook, 3229 East Eleventh street, will give a feast of oats, bran and ground corn, with trimmings of real hay, to the neglected cobs and fallen thoroughbreds of all sections in the big Auditorium Christmas day. "It will not be an equine quality event," Mrs. Hornbrook said yesterday, "but it will be on invitations, anyway. This is to prevent spongers from feeding a team at our expense. The money will be raised by subscription. We are asking the wholesale houses to donate enough feed for several hundred animals." Call at Convention hall Christmas day between 9 a. m. and 6 p. m .
"Someone has got to take up the horse's end of this charity proposition. It is not right that people should go on year after year giving alms to the human derelicts and entirely ignoring man's best friend, his horse. The scheme to give old work horses at least one square meal has been carried out to perfection in Norway, and someone should try it here. I suppose it will be scoffed at by some, but that is because it is new. In a few years, when through such humble means the attention of the world is directed toward the old horse and his suffering, it will be looked upon in a different light." Edwin R. Weeks, president of the Humane Society, is in favor of the "banquet." "Not for itself," he said yesterday, "but merely as a means to bring the suffering of our four-footed friends before local philanthropists. The Chicago idea of tagging the horses that are misused or underfed is not a poor one, but this one will get emaciated subjects of charity together by the hundred, in one hall, and let people see them." Be Addressed to the Mayor. The Mayor's Christmas Tree association, which was suggested and carried out last year for the first time in the history of Kansas City, is preparing to give the deserving poor children of this city a great treat this Christmas. Elaborate plans are being worked out by the committee. Headquarters have been opened in the Reliance building at Tenth and McGee streets, where contributions will be received, and also the names of the poor. The city will be canvassed during the next three weeks for the names of the children to be placed on the list. Several large Christmas trees will be prepared in Convention hall where the big event is to take place on the night of December 24, and under the direction of the distribution committee the presents will be given to all children who are deemed entitled to receive them. Names, or suggestions as to distribution of presents, should be addressed to the mayor, and all checks and remittances for the mayor's Christmas tree should be plainly marked and mailed to the city comptroller, Gus Pearson, treasurer of the association for this year. The members of the executive committee are Thomas Watts, Louis W. Shouse, Jacob Billikopf, M. G. Harman, A. E. Hutchings, Dave McDonnell, Henry Manke, Rev. Charles W. Moore, Steve Sedweek, T. T. Crittenden, John F. Pelletier, Franklin D. Hudson, A. Judah, George F. Damon, Justin A. Runyan, Gus Pearson, H. E. Barker and George C. Hale. Over $5,000 was raised for the Fireman's pension fund at the Firemen's annual ball in Convention hall last night, which was attended by nearly 6,000 people. The actual ticket sales amounted to over $5,600, and the checking stands furnished considerable additional revenue. This fund is in charge of a committee of firemen, and is disbursed under their direction to provide for the firemen's families in cases of sickness and death. The grand march, led by Chief John Egner and Mrs. Egner, started at 9 o'clock. From then until the early morning the dancing continued, there being twenty-four numbers on the programme. As many as 1,500 couples were on the floor at one time. Deveny's orchestra of twenty pieces furnished the music. For two hours yesterday afternoon 10,000 people sat in Convention hall while that master of harmony and technique, John Philip Sousa, the most characteristic band conductor in the world, and his aggregation of musicians, probably the finest reed and brass artists in the country, rendered a programme, which for purity of melody has rarely been equalled in this or any other city. The programme originally consisted of thirteen numbers and was what might be termed of the heavy order, but the spontaneous appreciation of the music by the vast gathering, was such that before the great conductor had made his final bow, his band and soloist had rendered fourteen encores and the popular dances and marches of the day had won an equal share of applause with the composition of the old masters. It has been said that Sousa's control over his men is so great that were he to lose his hands he could still keep them in absolute time and accord by the flash of his eyes, a bat of an eyelid or the quiver of a muscle. And he uses all of these in addition to the baton, his arms and his fingers. In fact at times his entire body is in motion. Never once does the musician, no matter how far back he may be seated, lose sight of every movement of Sousa and his splendid control counts no little in the harmony. Never is there a note that is just the fraction of a beat too long, never is there the roar of a drum or the jingle of a bell that vibrates for the fraction of a second longer than Sousa desires it, and when Sousa is through the entire band is through, or he knows the reason. The band, every member of which is an artist, makes the music, it is true, but Sousa makes the band and so considerable honor should go to him, but the players deserve equally as much. The programme yesterday afternoon opened with Liszt's Second Polonaise, and the applause continued until "El Capitan," one of Sousa's early compositions, was given. Again, an ovation greeted the music and continued until Mr. Clark made his bow for his coronet solo, "Sounds From the Hudson," one of his own compositions. As the first encore he gave the "Carnival of Venice," and as a second the "Sextet from Lucia Di Lammermoor," with three coronets and three trombones. Liszt's "Fourteenth Rhapsody" brought the programme to a close, after the band master had been on the stage playing almost continuously for three hours, not including a ten-minute intermission. In fact, so constant was the applause that Sousa had hardly stepped from his platform before he had to step back again with an encore and this kept up the entire afternoon. Another large audience and one equally as enthusiastic greeted the band last night. It seems a pity that people will insist on taking children from two months to four years old to concerts, but they do it not only in Kansas City but everywhere else. Several of these were in attendance at Convention hall yesterday afternoon and Sousa, who is sensitive to disturbance, was visibly irritated by the cries of children while much of the low music was lost on the audience. DR. B. F. ROLLER, The Vanquished (right). For the second time within a year Frank Gotch of Humboldt, Ia., the world's wrestling champion, defended his title against Dr. B. F. Roller of Seattle in Convention hall last night, winning the match in straight falls. The Seattle athlete put up a much better battle against the champion than he did the last time they met, but Gotch proved beyond a shadow of a doubt that he is still the greatest wrestler in the universe. The first fall was won by a combination crotch and half-Nelson hold and the second by a toe hold. From the time the men went on the mat until the final toe hold caused the bones in Roller's foot and ankle to all but snap in two, as his expression showed the torture he was enduring, it was plain to the 10,000 or more spectators that Gotch was the master. Every time he took a hold it made Roller exert every effort he had at his command to break it, and twice he failed to do this, thus losing the bout. 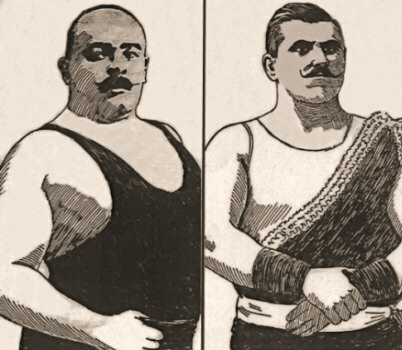 Roller had many holds which would have been on less powerful grapplers, but Gotch broke them whenever he tried, and his strength was far too great to be overcome by the cleverness and power of the Seattle physician. That the crowd, one of the largest that ever assembled to witness a wrestling bout in Convention hall, enjoyed it immensely was shown by the unlimited applause which greeted the athletes as they entered the arena for each fall and the ovation accorded them at the close, probably was the greatest yet given a pair of wrestlers at the close of a bout. As Roller, the game and conquered combatant arose to his feet after Gotch had put a hold on him which even the referee was afraid break his ankle, the 10,000 people stood and applauded him for a full five minutes. He had put up a great battle and had lost to a champion. The crowd was satisfied with his showing. To Gotch it was the same old story. For years this big farmer from Humboldt and the conqueror of all American and foreign mat artists, has been accorded great ovations by Kansas City audiences. Those 10,000 hands which made a sound deafening to the ears had applauded Gotch many times before. He is their idol and they expect to be able to see him in action many more times. While Dr. Roller has improved in weight, strength and ability since he met Gotch in a similar match here last winter, so has the mighty champion. While many believed Gotch could not improve over the wonderful form he exhibited a year ago he seems to be even a greater champion. He has more confidence. He had is holds all perfected to a greater degree and his cleverness is decidedly better than a year ago. Roller has improved more than Frank because of the much better battle he gave the champion and he still believes that some time he may possibly win from Gotch, but at the present time his chance is as slim as a triple split hair. That it was a great bout is shown by the fact that the wrestlers worked hard every minute, and it took Gotch 1 hour 18 minutes and 59 seconds to gain the two falls over the physician from the Northwest. DR. ROLLER MADE SOME SWIFT MOVES TO BREAK THE TOE HOLD. Time after time during this bout Gotch tried the toe hold, and time after time Roller broke this famous hold when it seemed impossible for him to avoid losing a fall. The second fall was lost by the toe hold and it was a perfect one, pinning Roller to the mat without giving him the slightest chance to get away from it. Roller tried hard to break this hold and believed he might possibly win the match by doing so, as Gotch was not in the best condition and a little tired at the time. But Roller was also fatigued, and with the might champion bearing down with all his weight on his ankle, the physician was forced to submit. As Roller lay in Gotch's arms with his head on the mat and his foot and ankle being pressed out of shape in such a manner that he was being severely tortured, his face showed the agony he was in and fans began to move toward the door. This meant a great deal to Roller. As he gradually sank to the mat he saw the last flame of his championship aspirations flicker and again he made a grand effort to break the hold. The flame brightened, flickered again and was gone. Roller had lost. Gotch walked to his corner with that same old smile of a victory and left the arena quickly, while Roller received the congratulations of his friends for putting up such a grand battle and many were his friends. DR. ROLLER'S FOOT AFTER THE MATCH. All Roller had to say was, "I lost and to the greatest wrestler that ever lived. Gotch is unbeatable." 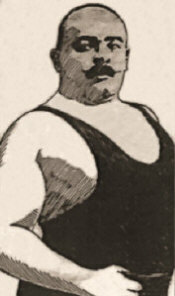 Gotch's remark was, "He gave me a grand battle and is a fine wrestler." SOUSA IN THE HALL NOV. 21. After a strenuous six months John Philip Sousa, composer-conductor, has begun his thirty-fifth annual tour as director of the globe-famed band that bears his name. Sousa will not give the current season his customary extension, as "the march king" will be obliged to devote his attention to the production of his new opera, "The Glass Blowers," which production will be made about the first of the new year. For this reason the band season will comprise a quick trip to the Pacific coast and return, closing in New York just before Christmas time. Sousa and his band will give two popular price concerts at Convention hall on the afternoon and evening of Sunday, November 21. Zbyszko, the Polish wrestler and champion of Europe, and Karl Alberg, French champion, arrived in Kansas City yesterday morning for their bout in Convention hall tonight. Both wrestlers appeared in uniform yesterday for the benefit of their admirers and the Missouri Athletic Club management. They are in excellent condition and a little training was indulged in by Zbyszko, while the Frenchman stated that he had finished his training and would not need any more work before the battle tonight. This match will give local followers of the mat game a chance to get a line on the ability of the man who expects to defeat Gotch for the world title in the near future. Zbyszko is entirely different from the average foreigner who appears on the mat in this country. He is the most powerful man in all Europe and is built entirely different from Gotch and other top notchers. He is but five feet eight inches tall, and weighs 245 pounds stripped. His arms, legs, neck and chest are larger than any other wrestler in the world. He is built "from the ground up," as wrestlers call it, and it is a difficult matter for any mat artist to take him off his feet. This is why he is a better catch-as-catch-can wrestler than most foreigners and this is the reason also that Gotch will find a hard man to throw when he meets the Polish athlete. Zbyszko is a gentleman and understands the English language. He is a much finer type of a man than the average foreign grappler. He knows Raicevich well and says that the Italian who showed a "yellow streak" on the mat here not long ago, is not in the championship class and is no good for high class bouts, which corresponds very nicely with the opinion of local followers of the game. Alberg is one of the best built athletes in France. He is about the same build as Gotch is, is a powerful grappler, although it is not believed that he will be able to throw the Pole. 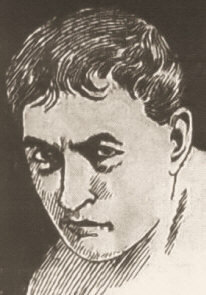 Like Rouel De Rouen, Alberg has the reputation of being a rough wrestler and few Frenchmen have ever given up without a hard battle in the local arena. The advance sale of seats indicated that there will be a big crowd at the bout tonight. There will be a couple of preliminaries. Dave Porteous will referee. Those persons who have followed closely the remarkable careers of Maxwell Kennedy, Frank Vrooman and Laurence Smith, boy singers, are pointing to a remarkable coincidence in the life history of the three boys. Although reared in widely separated sections of the country, these boys have attained almost international reputations because of the remarkable qualities of their voices. 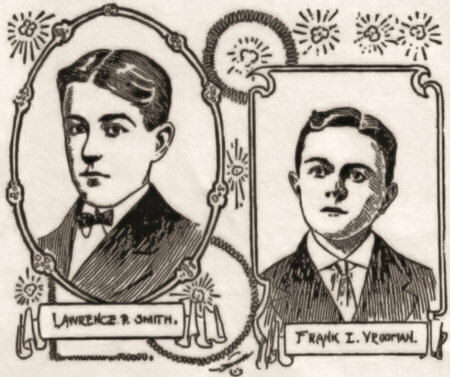 Two of these singers, Laurence Powars Smith and Frank Ellsworth Vrooman, met for the first time at Convention hall in Kansas City, Mo., where they appeared on the programme and held spellbound the great assembly which had gathered to honor the postal clerks of the country. Sitting opposite each other at the banquet table and sharing equally the congratulations of hundreds of persons who had been thrilled by the remarkable carrying power of their young voices were the boy singers and their parents. For a long time Mrs. Clarence J. Voorman, the mother of Frankie, gazed at the smiling countenance of Mrs. C. G. Smith, the mother of Laurence, seeing there something that carried her back in memory to her girlhood days in Junction City, Kas., when her dearest friend and playmate had been Laura Patterson, a girl her own age. "I am sure you must be my old schoolmate, Laura Patterson," said Mrs. Vrooman, reaching her hand across the table. "Don't you remember me? Lottie Wood." The two friends who had not met for thirty years quickly reverted to by-gone days and spoke with wonder of the coincidence that the mothers of the two greatest boy singers should have been playmates in their childhood days. The wonder of Mrs. Vrooman was increased, however, when Mrs. Smith spoke of little Frankie Kennedy, who "turned ropes," "spun tops" and did many other wonderful things for their edification while attending the public school in Junction City. Mrs. Vrooman then learned for the first time that this same little Frank Kennedy is the father of Maxwell Kennedy, the wonderful boy singer. Laurence Powars Smith is now 17 years old and was born in Ottawa, Kas. His former rich soprano voice combines a wonderful interpretation with great carrying power and has now developed into a tenor of the highest quality. He is the son of C. G. Smith, president of the People's National bank, Kansas City, Kas. His services are much in demand throughout the country, especially at Chautauquas. He is now engaged as soloist at the Linwood Boulevard Presbyterian church, Kansas City, Mo. Frankie Vrooman is 13 years old. He is a son of Clarance J. Vrooman, 3114 Washington street, Kansas City, Mo. Frankie is a slight, manly little chap, unaffected; and a typical American school boy. His voice is a rich soprano, and every word is enunciated perfectly, so that the carrying power is remarkable. he has been singing in public three years and has met with much success. On June 13 he sung in the Westminster Presbyterian church of Minneapolis. He is a protege of Walton Holmes, and a brilliant future is predicted. At present he is soloist at St. Paul's Episcopal church, Fortieth and Main streets, Kansas City, Mo. An audience numbering about 7,000 people in Convention hall last night cheered for a minute a stereopticon picture of a tiny dome of snow from which floated the Stars and Stripes. That picture represented the successful conquest of the polar mystery, and the 7,000 people had gathered to see Dr. Frederick A. Cook, the conqueror, and hear him tell of his victory. The story was one of enthralling interest, told in anything but a heroic manner, yet told convincingly, straightforwardly, simply, without dramatic climaxes or rhetorical graces. It is doubtful if there was an individual in the big audience who doubted for a moment Dr. Cook was telling anything but the literal truth. Certainly it was not a Peary audience, for when the doctor mentioned the name of his rival in connection with the other explorers who had preceded him into the Arctic wilds, there was not the faintest ripple of applause. Dr. Cook's lecture was one of the most interesting features of the week of fall festivities. The doctor cannot be called an orator in the superficial sense. He labored under several handicaps last night, not the least of which was a heavy cold which rendered his voice conspicuously hoarse and which drove him frequently to the ice water. When Dr. Cook made his first appearance upon the platform he was heartily applauded, and when he arose to begin his lecture, after a brief laudatory introduction by Mayor Crittenden, he received a distinct ovation. Without prelude he plunged into his lecture, which was delivered in a conversational tone throughout. It was repeatedly punctuated with applause as he narrated some incident more than usually dramatic in its nature or illustrative of the tremendous obstacles overcome. There was, of course, a special round of applause when he referred to the fact that the pemmican which furnished food for the northward trip was put up by the Armours, and that in all probability some of it came from Kansas City. The lecture was copiously illustrated with stereopticon views from photographs taken by Dr. Cook himself. Throughout the lecture the orator's characteristic modesty was almost obtrusive, if the paradox may be thus stated. Very rarely was the personal pronoun used and the speaker paid a specially generous tribute to the Eskimos who proved indispensable to the success of the undertaking. He warmly commended the two young men who went to the pole with him and in the culminating picture showing the flag planted at the pole the only living figures were those of these two Eskimos. Of course Dr. Cook himself could not have been in his own pictures, but it is doubtful if Commander Peary gave his sole companion even this share of the honor. At any rate Cook did. The only mention of Peary was the one reference to him in the list of polar explorers. No allusion was made to the experiences at the hands of Peary's representative at Etah on Dr. Cook's return and nothing whatever was said as to the controversy between Cook and Peary. Throughout, the lecture was plain narrative of facts, the veracity of which the speaker did not appear to think would be doubted. Dr. Cook's voice did not carry to all parts of the hall, but few people left before the lecture closed with Dr. Cook's promise to send a ship to Etah and bring back to this country the two companions on the great polar dash. Early in the course of the lecture a song dedicated to Dr. Cook by a local singer.